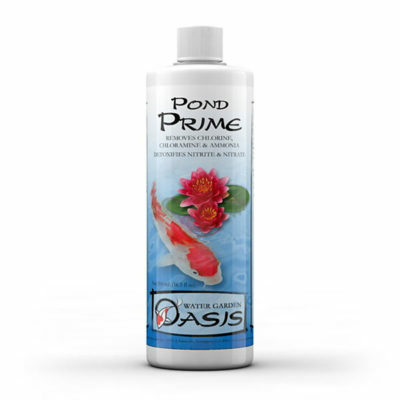 Pond Prime is a water complete conditioner that removes chlorine, chloramine, and detoxifies ammonia and nitrite. It also provides essential ions and stimulates fishes natural slime coat. Pond Prime® enhances nitrate removal, and it will also detoxify any heavy metals found in the tap water at typical concentration levels. 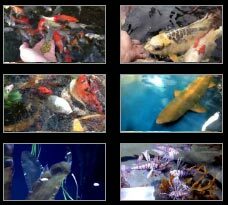 It should be the first choice conditioner when setting up a new pond, adding, or changing water. No other product is required to make water safe, even in high chloramine situations. Unlike competing products, Pond Prime® does not cause a pH drop or overactivate skimmers, and is available in a size that will suit your pond. we carry 4 sizes: 500 ml, 1 Litre, 2 litre and 4 litre. A 1 Litre bottle treats over 20,000 US gallons, much more than competing products. If you use city water to fill your pond, then you should always use a dechlorinator / water conditioner whenever you top up your pond, or do a partial water change. Although chlorine will dissipate from water in 24 hours, chloramine can linger in the pond for much longer, and possibly build up to dangerous levels if water is added frequently with using a water conditioner. It is always a good idea to keep an extra bottle on hand in case of an emergency, if you ever need to add a lot of water to your pond.